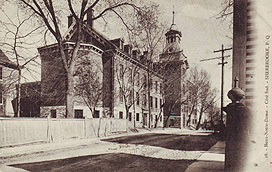 Seen here c.1906, the convent was founded in 1857 and run by the nuns of the Congregation of Notre-Dame. For much of its history, the school was bilingual, with students in the primary, model (intermediate) and classic (senior) grades. Mont Notre-Dame, which operates to this day, is now a college with an international curriculum.